A fantastic grass that performs wonderfully well in our climate. 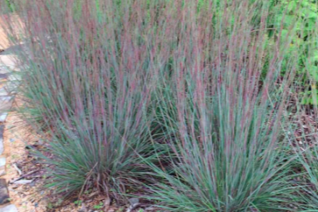 A clumping grass with very upright blue foliage. In summer inflorescences rise above the leaves with fine fluffy whitish flowers- provides a dramatic hazy effect. In autumn the 28″ tall grass becomes a whole other color palette. Deep raspberry and purple with tints of red before going over to all all reddish orange. An excellent color trip not the way to dormancy. When dormant it remains a presence and looks nice through winter. Cut down to the ground in late winter/early spring to make way for fresh new foliage. Not evergreen. Average to enriched well drained soil with light summer water. Established plants in reasonably good soil will sale through summer drought with no ill effects. Clumps expand over time to 2′ wide. Full sun. Easy grass. May self sow in open disturbed soil.